Today’s message will be about Psalm 41, but I want you to turn with me first to the Gospel of John chapter 13. I want to show you why we are going to study Psalm 41 at the beginning of this Passion Week. John chapter 13. By the time you get to chapter 13, it’s Thursday night, and Jesus is meeting with His disciples in the Upper Room. We tend to call this the Last Supper. They ate the Passover Meal. Jesus reinterpreted the meal to point to Him, especially the bread and the cup. And John tells us that He washed His disciples feet. That’s at the beginning of the chapter, verses 1 through 17. I want to pick up the story in verse 18. It’s a story of a predicted betrayal. Jesus knows that He is going to be betrayed. And He wants His disciples to know that He knows. He knows in advance, and He wants them to know that He knows. This is not a surprise for Jesus. He knew this betrayal was coming. Do you think that made it any easier? It probably made it harder in this case. ‘I am not referring to all of you; I know those I have chosen. But this is to fulfill the scripture: 'He who shares my bread has lifted up his heel against me.' I am telling you now before it happens, so that when it does happen you will believe that I am He. I tell you the truth, whoever accepts anyone I send accepts me; and whoever accepts me accepts the one who sent me.’ After he had said this, Jesus was troubled in spirit and testified, ‘I tell you the truth, one of you is going to betray me.’ His disciples stared at one another, at a loss to know which of them he meant. Jesus answered, ‘It is the one to whom I will give this piece of bread when I have dipped it in the dish.’ Then, dipping the piece of bread, he gave it to Judas Iscariot, son of Simon. As soon as Judas took the bread, Satan entered into him. ‘What you are about to do, do quickly,’ Jesus told him, but no one at the meal understood why Jesus said this to him. Since Judas had charge of the money, some thought Jesus was telling him to buy what was needed for the Feast, or to give something to the poor. Did you ever notice how the Bible is full of hypertext? You know what I mean? Like when you are on a website, and the words are blue or underlined? And if you move your finger or your cursor over that word, it’s clickable? And then if you click on it, it will take you to another place that is connected to that place? And then to other places? The Bible is overflowing with clickable links to other places in the Bible. It’s all connected. It’s like a giant web of connections, that when you study them long enough, you see how they are genuinely related to one another. Did you see why in John 13, we are going to study Psalm 41? Why we are going to click from the Last Supper in the Upper Room back into the Old Testament to the Song of the Sick King? Look again at verse 18. That scripture is Psalm 41, verse 9. Click there with me. Turn there with me. Psalm 41. I call this Psalm 41, "The Song of the Sick King." 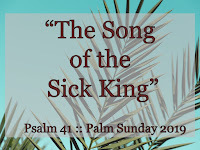 Have you ever sung a song about a king who was sick and wanted to get better? Me neither, but Israel had a song in their songbook about that very thing. King David wrote it for his director of music. And the Holy Spirit inspired it and made sure that it was preserved and included in the sacred songs of the Hebrew psalter. I’ve been learning a lot about the Psalms this year. Instead of reading all the way through my Bible in 2019, I’ve set out to really study the Psalms in my personal devotional times. There are 150 of them, and I’m taking a few days on each one. I read a portion of a Psalm set out by Pastor Tim Keller in this little book, “The Songs of Jesus” and then he has a short explanation and then a prayer. Kind of like The Daily Bread. And then I turn into two different commentaries to study that same passage more indepth. Derek Kidner and Tremper Longman. And see what light they have to shed on that portion of scripture. And then I turn in the Trinity Psalter Hymnal that I bought my wife last year (and then stole from her this year) and I read and pray through their setting of the Psalm to music. They are so helpful for expressing our human emotions. For expressing our deepest desires and thoughts and feelings. For praising God in the highest ways and also for expressing our other feelings. The bad feelings. The painful feelings. The suffering. The best book I’ve read so far in 2019 is this one called, Dark Clouds, Deep Mercy: Discovering the Grace of Lament. It’s by a pastor named Mark Vroegop, and it’s pure gold. Pastor Mark teaches about this painful but powerful form of prayer that’s all over the Bible called lament. It’s those prayers that are in a minor key. Those prayers that are full of pain and suffering. And about a third of the Psalms have lament in them, as well. Did you ever notice how sad the psalms can be? They can be really joyful, for sure. That’s the major key. Hallelujah! But the Bible is about all of life, not just the joyful parts. And there are songs in the Bible’s fullest book of songs that give voice to suffering and pain. And Psalm 41 is one of them. Actually, it has both praise and lament in it. It’s kind of a mix of the two. 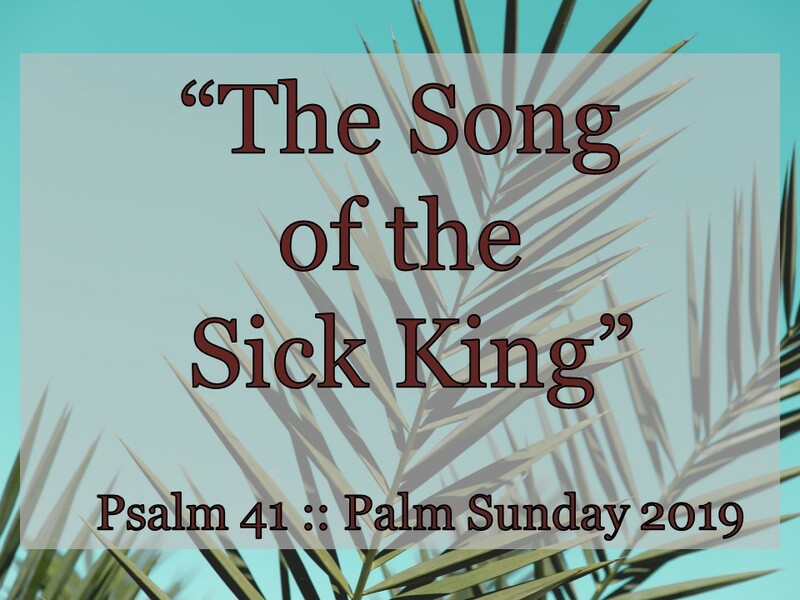 But because of its sorrowful lament, Psalm 41 was perfect for the Man of Sorrows to reach back into when He was pondering the pain of His betrayal. Let’s begin reading it together. Verses 1 through 3 of the Song of the Sick King. #1. BLESSED ARE THE KIND. Now, this song does not start out sad. We sing that, can’t we? What good news that is. This song starts with blessing. The Hebrew word is “ashre,” which is a lot like the word “makarios” that we learned about last year in the Beatitudes. Blessed is he who has regard for the week. David is talking about the lowly. The people at the bottom. Perhaps they are sick. Perhaps they are unpopular. Perhaps they are oppressed. Perhaps they are literally poor or just weak and lowly. David says that the person who is kind and generous and merciful to people like that are the kind of person that the LORD loves to bless. Right? What Jesus taught in Matthew 5:7. The pattern that David is pointing out is that God is generous to those who have been generous, especially when you are generous to those who can’t pay you back. Now, this is not something that you earn by being generous. Tim Keller points out that the opposite is also true. This works the other way around, in that we can only be merciful and generous because God has already shown us mercy and grace. But if we have gotten it from the Lord, we will pour it out on others, and in the process, we’ll find that the Lord is pouring it out on us again. But if we don’t pour it out on others, we can’t expect to see it either. Now, we get to why David is singing about this. David is on his sickbed. David is on his bed of illness. And David believes that God is going to raise him up again because he’s been kind to the lowly, considerate to the poor, and shown regard for the weak. We don’t always think like this, but it’s really just praying back to God His own promises. We’ll see that King David did not think he did this perfectly. But he believed that he did do it. Do we help out those who are poor and needy and can’t pay us back? See? He doesn’t think he’s perfect. He knows that he’s a sinner. I don’t think he’s saying that this sickness is because of a particular sin. I think he’s saying that he knows that he doesn’t deserve healing. He’s a sinner. He doesn’t deserve anything good. But he knows that God is merciful especially to those who have been merciful, as David knows that he has been. And then...this song takes a turn for the worse. This song of confidence grows dark and sad. There are 5 verses in a row that are full of pain. We don’t sing enough songs about pain. We like to skip those verses, don’t we? I mean, I do. Who wants to feel pain, much less sing about it? But pain is real. Suffering is real. The Bible is not Candyland. The Bible is not fake. The Bible is not the wonderful world of Oz. The Bible is full of all of the realities of reality, including the painful realities of reality. “In this world, you will have trouble,” Jesus said. And you probably need some songs to sing about life being hard when life gets hard. So He gives us songs like Psalm 41. David put that in his song. By the way, we don’t know when this happened. The Bible doesn’t tell us a lot more about this particular occasion, this particular situation. And that’s alright because it is easier to apply to a lot of our own situations. We don’t know exactly what happened to David, but we know what it’s like. Do you have enemies like this? I wrote about this psalm in my book on resisting gossip. That’s what these are enemies are doing. Can you hear how much King David hurts when they are doing this to him? He’s sick, and this is how they are treating him. I hear the voice of Satan in their words. It’s not just David’s enemies who are treating him like this when he is down. #2. BETRAYED IS THE KING. Have you ever sang a song about being betrayed? I think there are bunch of relationship songs like that. Country and Western Songs about your girlfriend leaving you and taking the truck and the dog. And I think that all of Taylor Swift’s songs are about this, right? But this isn’t angry as much as it is hurt. This is lament. This is singing out your pain. And singing out your pain to your God. Have you prayed like that? I’ll bet you’ve felt those things. The Bible invites us to pray like that. Some commentators think it meant that he has turned his back on David, and so David is seeing his heels. But I think it’s more likely that David is down, and his friend has lifted his foot up to crush him when he’s down. Have you ever experienced betrayal like that? King David knew what it was like to be betrayed. And King Jesus does, too. John 13:18 quotes this verse right here, verse 9 and says that Jesus fulfilled it. Great King David was betrayed. And Great King David’s Greater Son Jesus was even more betrayed. He filled up that verse with all of the fulfillment that you could imagine. Do you remember how Judas did it? He betrayed Jesus with a kiss. He marked Jesus out with the symbol of intimate friendship. The one that had shared His bread! That very night, Jesus and Judas had shared a piece of bread together. And, you know what, Jesus died because of it. David is going to pray again in verse 10 that he be raised up to health. And he clearly believes that he will be. But Jesus did not get to escape the Cross. Judas betrayed Him, and He went to trial. He went to the grave. In verse 10, the Song of the Sick King grows confident again. Verse 10 sounds a lot like verse 4. God hasn’t done the healing yet. David is still praying for it. But he believes it is coming. And asks God to have mercy on and raise him up to health so that he can repay his enemies. It sounds vengeful, and there definitely is an element of that. But remember, David is the king. It’s David’s job to execute justice. And what his enemies are doing is actually treasonous. It’s not a joke. They are hoping the king will die and spreading news that he soon will. And somebody in his inner circle has lifted up his heal. David has to deal with that, or he wouldn’t be a good king. This is not vengeance, but it is vindication. It is justice on the way. Which should probably remind us of the justice that King Jesus will one day bring. David knows. He knows that God is pleased with him. He knows that the Lord delights in him. He knows that his God has good in store for him when this is all over. How much more should you and I be confident in the Lord’s love for us, on this side of the Cross? How much more should we rejoice that our enemies (the world, the flesh, and the devil) will not triumph over us because of the Cross and the Resurrection? David knew that he was not perfect. He admitted that readily in verse 4. But he also knew that he had a basic integrity of heart. He was a man after God’s own heart. He knew that he had a heart for the heart of God. He knew that he had a real relationship with God and that it showed in how he treated others. So, he knew that he was going to be upheld and set in the LORD’s presence forever. How much more do we know that that’s our future, as well? Jesus died, but He did not stay dead. We’re going to celebrate that big time next Sunday! King David just got up from his sickbed. King Jesus got up from the grave! His betrayal was greater, but His vindication was so much greater than we could ever imagine. #3. BLESSED BE THE KING OF KINGS. Verse 13 doesn’t just end the psalm, it ends the whole first book of the Psalms. Did you know there are 5 books of the Psalms? Psalm 41 is the last psalm of book 1. And each book ends with this kind of high praise. Because the LORD is worthy of it!